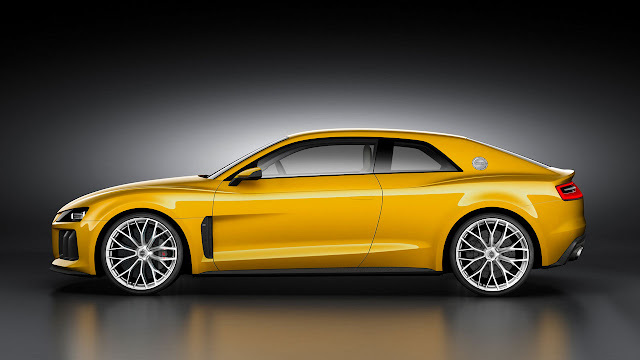 In celebration of the 30th anniversary of the Sport quattro - the musclebound short-wheelbase coupe originally conceived for the rally stages - Audi unveils its conceptual successor at the 2013 Frankfurt Motor Show. The Audi Sport quattro concept show car continues the grand quattro tradition, with a stunning coupe silhouette and plug-in hybrid drive delivering a system output of 700PS. quattro is Audi and Audi is quattro – the brand and the technology are indelibly linked. Since the debut of the “Ur-quattro” in 1980, Audi has sold more than five million cars with permanent all-wheel drive, far more than any other premium manufacturer worldwide. The advantages in terms of grip, control and composure delivered by the quattro system have now been reaped by drivers, initially in rallying and then on the road, for over three decades. 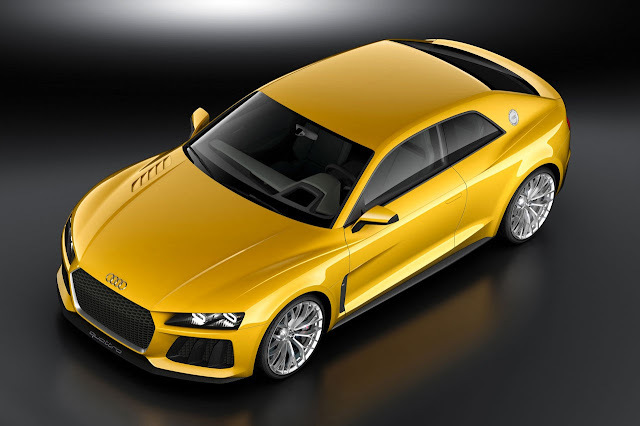 With the Audi Sport quattro concept show car, Audi is taking this grand tradition and projecting it into the future with the help of ideas that were first seen in the Audi quattro concept study of 2010. The DNA of the Ur-quattro is immediately evident in the powerful road stance of the Sport quattro concept. Its taut, sinewy body squats purposefully on 21-inch centre-locking wheels with a five twin-spoke design, and its low-slung, foursquare look is largely attributable to an overall length of 4,602 millimetres, a generous width of 1,964 millimetres and a height of just 1,386 millimetres, underpinned by a wheelbase of 2,784 millimetres. Like the Audi Sport quattro, the Audi Sport quattro concept was designed in the spirit of motorsport. None of its design solutions are an end unto themselves. Each is driven by a technical function, and several pay homage to the quattro models of the early 1980s. These include the angular, flat C-pillars and the rectangular double headlights featuring Audi's groundbreaking Matrix LED technology, which will be available by the end of this year in the new generation Audi A8. Two very flat structures are visible inside the headlight. The wrap-around daytime running lights together with the central low-beam units and the Audi Matrix LED make for a sporty, determined look. The headlights and tail lights are a reinterpretation of lightweight construction. Unusually, the headlights do not have a fascia, exposing the LED heat sinks, while the tail lights reduce glass and housing to a minimum. The LED high-beam unit of the Audi Matrix LED headlights is comprised of numerous individual diodes. The individual LEDs, which work in tandem with upstream lenses and reflectors, always deliver excellent illumination. They are activated, deactivated or dimmed individually according to the situation. Another design tribute are the “blisters” above the wings, which have been reinterpreted and strongly accentuated. They give the body even greater emotional appeal and broad shoulders. Throughout the car, sharp contours frame tautly muscular surfaces. With their interplay between convex and concave curvatures, the bonnet, wings and flanks help to signal the intent of the Audi Sport quattro concept. The front of the show car is characterised by the hexagonal single-frame grille with a new, sculpted grille insert, a typical element borrowed from motorsport. The grille is part of Audi's new design philosophy and provides a first glimpse at the future design of the high performance production models. The grille’s lower section is virtually vertical; the upper section follows the line of the bonnet. The low grille emphasises the width of the car. Two large, vertical blades divide each of the large air inlets, and their form is taken up by the creases in the bonnet. The Carbon Fibre Reinforced Polymer (CFRP) splitter is shifted far to the front, in the style of a racing car. The proportions of the rear of the car are defined by the combination of a flat greenhouse and broad shoulders. The spoiler at the lower edge of the rear window underscores the car's width. Another distinctive element at the rear of the show car is the CFRP diffuser, which extends far upward. Similar to the single-frame grille, its upper section is honeycombed, whereas the lower section houses two large, oval tailpipes. Mounted on a black CFRP facing, the tail lights are rectangular – a typical quattro styling cue – and emphasise the width of the car. A spoiler extends from the rear hatch at higher speeds. The luggage compartment, which is reinforced by a solid crossbeam beneath the rear shelf, has a capacity of 300 litres (10.59 cubic ft). Archetypal Audi attention to detail is evident in the lightweight CFRP construction for the flared sills and the power door handles which extend automatically to meet an approaching hand. To complete the look, the four rings adorn the front, the rear, the air outlets behind the front wheels and the C-pillars. 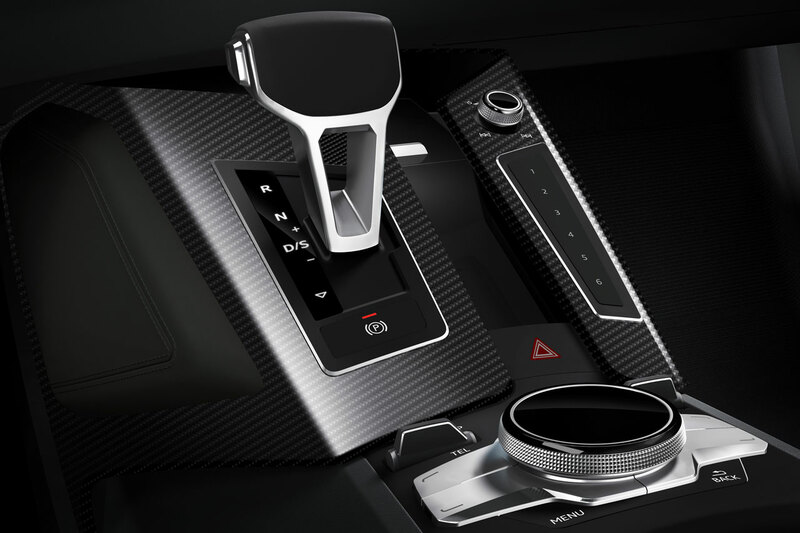 The purity of purpose carries over to the interior of the Audi Sport quattro concept. The spacious cabin is focused on the driver, with the steering wheel, digital instrument cluster and head-up display all in the direct field of view. A line running below the windscreen encircles both the driver and passenger and integrates all ergonomic functions such as the door openers. 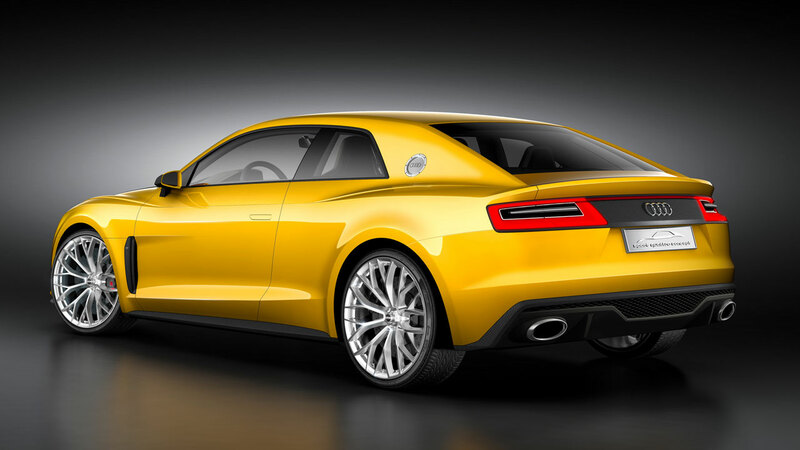 The lightweight construction typical of Audi is reflected both in the design and in the choice of materials. Viewed from above, the slim dashboard is reminiscent of the wing of a glider. The support structure of the interior is a carbon shell that also serves as a storage compartment in the side doors. Elements like this make lightweight construction visible. The quattro drivetrain runs beneath the continuous centre console. Racing-inspired bucket seats with folding backs, sculpted side bolsters and integrated head restraints up front don’t inhibit access to the two rear seats thanks to their folding mechanism. A crossbeam behind the rear seats provides for additional rigidity. Great attention to detail is reflected in both the choice of materials and the workmanship. The multifunction sports steering wheel provides a glimpse into future Audi production models. Choices include a Race mode with central speedometer, track information and a stopwatch, for example, or the Setup mode with detailed information about numerous race circuits. In addition, the touchwheel of the characteristic Audi MMI control unit makes it easy to enter information. The plug-in hybrid drive endows the Sport quattro concept with truly breathtaking performance from a mighty system output of 700PS and system torque of 800 Nm (590.05 lb-ft). Power flows through a modified eight-speed tiptronic transmission to the quattro powertrain, which features a sport differential on the rear axle. According to the applicable standard, the show car is also capable of up to 113mpg, equating to CO2 output of 59 grams per kilometre. The combustion engine is a 4.0-litre, twin-turbo V8. It produces 560PS and 700 Nm (516.29 lb-ft) of torque. The cylinder on demand (COD) system, which deactivates four cylinders under part load, and a start-stop system make the sonorous eight-cylinder unit very efficient. Located between the 4.0 TFSI unit and the transmission is a disc-shaped electric motor producing 110 kW and 400 Nm (295.02 lb-ft). It draws its traction energy from a liquid-cooled lithium-ion battery in the rear with a capacity of 14.1 kWh. The show car is charged via an Audi wall box, which uses intelligent charge management to ensure the optimal feed of energy to the lithium-ion battery. The Audi Sport quattro concept can cover up to 31 miles on electric power alone. An intelligent management system controls the interplay between the two drives as needed, and the driver can choose between various operating modes. In EV mode, only the electric motor is active. With a peak electric output of 110 kW and 400 Nm (295.02 lb-ft) of torque, electric driving both inside and outside the city is possible. An active accelerator indicates the transition to hybrid operation to the driver so that he/she can consciously control the switch between electric and hybrid driving modes. In Hybrid mode, environmental and route data are used to compute the optimal use of the electric motor and combustion engine for fuel efficiency and implement this via the operating strategy. If navigation is active, the route is optimised for efficiency. This mode also includes the ability to customise the operating strategy. If the driver wants to retain a certain amount of electric range or to drive certain route segments on electric power, they can use the Hold or Charge function to precisely adjust the charge of the battery even without charging from the power grid. When the V8 and the electric motor work together, the Audi Sport quattro concept accelerates from 0 to 62mph in 3.7 seconds – much like the powerful Audi rally cars once did. Its top speed is 189mph. The lightweight construction concept also plays a large part in this dynamic performance. The occupant cell combines ultra-high-strength steel panels and cast aluminium structural elements. The doors and wings are made of aluminium, and the roof, the bonnet and the rear hatch are made of CFRP. The result is a kerb weight including the battery pack of just 1,850 kilograms. The show car’s chassis is easily able to handle the drive system's power. Handling is as dynamic as it is stable. The front suspension features five control arms per wheel; the rear suspension follows the Audi track-controlled trapezoidal link principle. Tautly tuned springs and dampers connect the Audi Sport quattro concept firmly to the road. The dynamic steering varies its ratio as a function of driving speed. The brake callipers grip large, carbon fibre-ceramic brake discs, and the tyre format is 285/30 R 21. Combining awe-inspiring power and performance delivered with 21st Century efficiency with styling that speaks volumes about its exceptional capabilities, the Sport quattro Concept is an undeniably worthy successor to the legendary Sport quattro, which made its debut at the 1983 Frankfurt Motor Show. Designed as a homologation model for the World Rally Championship, this exceptional 306PS powerhouse showcased many technical innovations, and was considered the supercar of its day. Its short wheelbase honed its handling and gave it an unmistakable look, and in competition form it wrote racing history. Walter Röhrl drove it to a convincing victory in the 1987 Pike's Peak International Hill Climb in Colorado, U.S.A.